Meet Mrs. Dunn, an English widow who cooks for the school lunch service and communes with the spirits of dead composers. When a crusading American newspaperman tries to unmask her as a fraud, he finds more to the so-called spiritualist than meets the eye. A world premiere comic drama inspired by surreal true events, The Spiritualist reveals the intersection between art and commerce, sanity and the hope for transcendence. With Amy Herzberg as Rosemary Dunn. Amy Herzberg (Rosemary Dunn) is associate artistic director and a co-founder of TheatreSquared, and directs the MFA/BA acting programs at the University of Arkansas. Acting credits include work at La Jolla Playhouse, George Street Playhouse, Valle Christi International Theatre Festival (Italy), and San Diego Repertory Theatre, where she was in the resident company for four years. 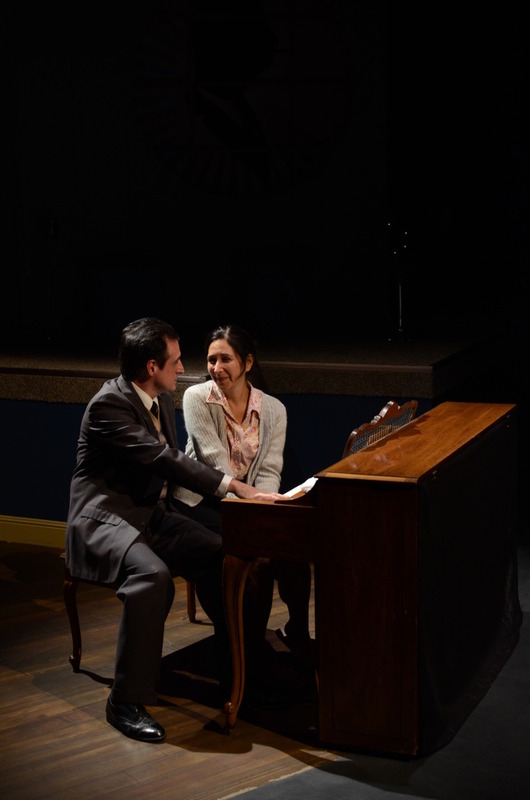 Recent performances in new plays include the Blank Theatre (Los Angeles), New Harmony Project (Indiana), New York Theatre Workshop, Theatre J (Washington DC), Cambridge University, and English Theatre Berlin (Germany). For TheatreSquared, she has directed Bad Dates, The Last Five Years, Moonlight and Magnolias and Next to Normal. She appeared in T2’s world premiere of My Father’s War, a play about her father’s experiences in WWII, and in numerous roles for the Arkansas New Play Festival. She has directed over 30 productions for the U of A, including most recently 33 Variations. She has received numerous honors for her work, including the Kennedy Center’s ACTF National Acting Teacher Fellowship (2003), U of A’s Charles and Nadine Baum Teaching Award (2005), Fulbright College Master Teacher Award (2013), and, along with her husband, the Governor’s Arts Award (2013). She holds an MFA in Acting from Cal Arts, with additional training from American Conservatory Theatre and the Actors Center in New York. Kathy Logelin (Margaret / Haynes / Clara) returns to T2, where she appeared in Noises Off, It’s a Wonderful Life, Mauritius, and the 2011 and 2012 Arkansas New Play Festival. A native Chicagoan, she was recently seen in The Electric Baby, Precious Little, These Shining Lives (Rivendell Theatre Ensemble—company member); Betrayal, Arms and the Man (Oak Park Theatre Festival); Widowers’ Houses (TimeLine); and The Last Days of Judas Iscariot (Victory Gardens/The Gift Theatre). Regional credits include Macbeth (Notre Dame Shakespeare Festival) and five seasons with Illinois Shakespeare Festival, where credits include The Three Musketeers, The Merry Wives of Windsor, Romeo and Juliet, A Midsummer Night’s Dream and All’s Well That Ends Well. She holds a BS in Acting from Illinois State University. Steven Marzolf (Liszt) returns to T2, where his previous credits include Edgar Allan Poe in The Fall of the House and the 2012 Arkansas New Play Festival. He also directed Romeo and Juliet in Concert, a collaboration between T2 and The South Arkansas Symphony in El Dorado, Arkansas. 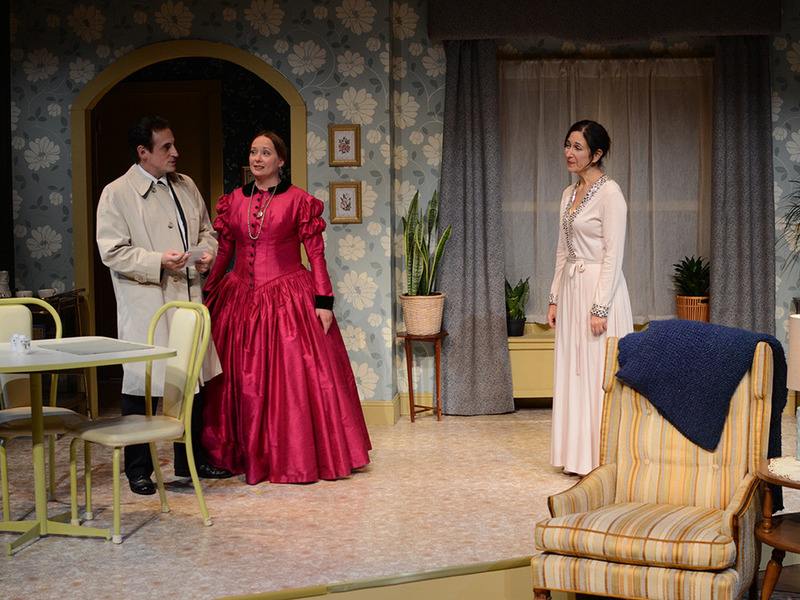 Regional credits include several productions at The Old Globe Theatre, La Jolla Playhouse, Milwaukee Repertory Theater, Chicago Shakespeare Theater and Steppenwolf Theatre Company, where he was a part of the original production of the 2008 Tony Award and Pulitzer Prize winning play August: Osage County. He was the voice of Ormsby in the documentary Up Among the Hills, a history of Fayetteville by Larry Foley. He has directed for The Stella Adler Institute in New York and The Side Project in Chicago. He holds an MFA in acting from The Old Globe Theatre/University of San Diego Professional Actor Training Program and teaches acting at University of Tulsa. 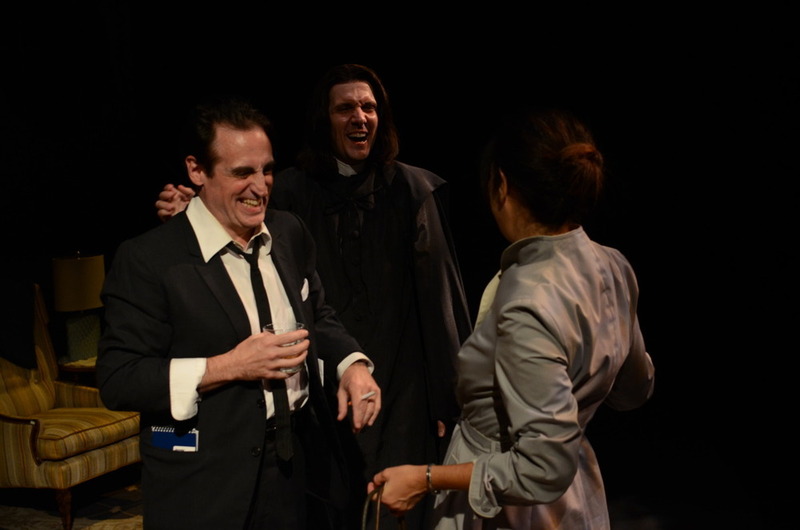 Sean Patrick Reilly (Roy Elgin) returns to T2, where he appeared in the Arkansas New Play Festival (2012, 2013) and directed Period of Adjustment. Broadway credits include Tracy Letts’s Superior Donuts and Martin McDonough’s The Beauty Queen of Leenane. Off Broadway: A Thick Description of Harry Smith at The Culture Project; David Mamet’s Lakeboat, Edmond, and Sexual Perversity in Chicago (Atlantic Theater Company); Sam Shepard’s Buried Child, Seduced States of Shock, Chicago (Signature Theatre Company ); Antigone (The Public/NYSF); Holy Water (Second Stage); The Unknown Icons (Circle in the Square); Painting X’s on the Moon (Naked Angels); The Killer Inside Me (The Promanade); Nebraska and The Gingham Dog (Circle Rep.); Gangster Apparel; The Third Miracle and Waiting to be Moved (Playwrights Horizons) and the Obie-winning BUK: The Life and Times of Charles Bukowski (Here Theatre), among others. Regional favorites include: The Front Page (Williamstown Theatre Festival); Doubt (Geva Theatre / Tour) Of Mice and Men, Chapter Two, Dial M for Murder (Westport Playhouse); American Buffalo, The Crucible, Glengarry Glen Ross (Alley Theatre); Bill W. and Dr. Bob (Cleveland Play House); Curse of the Starving Class, Fool for Love, The Seagull, Red Noses (Trinity Rep); Dancing at Lughnasa, The Trip to Bountiful (ART); The Caretaker (Dallas Theatre Center); The Glass Menagerie, Death of a Salesman (Kennedy Center); Waiting For Godot (Edinburgh Festival); King Lear, Henry IV, Twelfth Night, Julius Caesar, Taming of the Shrew, Othello, Titus Andronicus, Coriolanus, The Tempest, Measure for Measure, Romeo and Juliet, Henry V, Macbeth and Hamlet (Royal Shakespeare Company); among many. Film and television credits include: A Wife Alone (Winner, 2013 Brooklyn Film Fest), Fair Game, Howl, Following Bliss, Something Borrowed, Solitary Man, The Sorcerer’s Apprentice, Man of the Century, Jerry Maguire, State and Main, Sleepers; “Blue Bloods”(CBS); “Bored to Death” (HBO);“Mildred Pierce”(HBO); “Damages” (FX); “Third Watch” (NBC); “The Black Donnellys” (NBC); and three seasons on “Law and Order” (NBC). He trained at the Royal Academy of Dramatic Art and was educated at Harvard and Oxford. John T. Smith (Beethoven / BBC Host) returns to T2, where he previously appeared as David Poe in The Fall of the House, Bill Cheatham in Sundown Town, Philip in Mauritius and as the Record Keeper in Jacob Marley’s Christmas Carol. Chicago credits include Silvius in As You Like It (Oak Park Festival Theatre). Regional credits include Tom in The Glass Menagerie, Victor in Private Lives (St. Croix Festival Theatre); King in Big River, Banquo in Macbeth (Stephen Foster Productions); and Father in a regional tour of a Theatre for Young Audiences production of Beauty and the Beast (American Family Theatre). He holds an MFA in Acting from the University of Arkansas. Kristopher M. Stoker (Peter Clifton / BBC Guest) returns to T2, where he was last seen as Garry in Noises Off and previously in The 39 Steps, It’s a Wonderful Life, and My Father’s War. Regional credits include An Ideal Husband, Othello, Hamlet, Timon of Athens, A Midsummer Night’s Dream, Macbeth, The Seagull, Twelfth Night (Cincinnati Shakespeare Company); and The Lion, the Witch, and the Wardrobe (Trike Theatre). Film credits include In Sickness and In Health and Paranoia. He studied improv at The Upright Citizens Brigade in New York and is currently an instructor of theatre at the University of Arkansas. Kevin Christopher Fox (Director) returns to T2, where he previously directed Sundown Town and The Fall of the House. He also appeared in T2’s Mauritius and directed and performed in the Arkansas New Play Festival (2010, 2012, 2013). A Chicago-based actor and director, he has performed with Writers Theatre, Chicago Dramatists, Steppenwolf, American Players Theatre, Northlight, Remy Bumppo, Court, Noble Fool, Mary-Arrchie and Montana Shakespeare in the Parks, among others. Chicago directing highlights include The Last Days of Judas Iscariot (Gift Theatre, Victory Gardens transfer); Beggars in the House of Plenty (Mary-Arrchie); Betrayal, Arms and the Man (Oak Park Festival Theatre), Widowers’ Houses (TimeLine Theatre), Buicks (Precious Mettle), and the Chicago premiere of St Crispin’s Day (Strawdog—four Jeff Citation nominations). Emily Bohannan (Stage Manager) returns to T2, where she served as stage manager for the 2013 Arkansas New Play Festival and ASM for Next to Normal, Sons of the Prophet, Period of Adjustment, Noises Off, The Fall of the House, and Boeing-Boeing. She holds a BA in Drama from the University of Arkansas. Shawn Irish (Scenic and Lighting Designer) has designed for T2 The Fall of the House, The 39 Steps, Underneath the Lintel, ‘Twas the Night, The Complete Works (Abridged), Drawer Boy, The Mystery of Irma Vep, Jacob Marley’s Christmas Carol, Noodle Doodle Box, Moonlight and Magnolias and My Father’s War. Recent credits include a new adaptation of Little Women by Cody Daigle, Alan Ayckbourn’s House and Garden, I Love You Because, Romeo and Juliet (Playhouse Theatre); The Man Who Came To Dinner, The Music Man (Arrowrock Lyceum); and Arthur Miller’s The Price (Northern Stage). His award-winning lighting design for Big Love was featured in Theatre Design and Technology and American Theatre magazines and at the Prague Quadrennial Exhibit in 2007. He is the new head of lighting design at the University of Arkansas. Will Eubanks (Sound Designer / Assistant Technical Director) returns to T2, where he served as sound designer/master carpenter for Period of Adjustment and Noises Off, sound designer for Every Christmas Story Ever Told, and assistant sound designer for Tigers Be Still and The 39 Steps. He holds a BA in Drama from the University of Arkansas, where select sound design credits include A Streetcar Named Desire, 33 Variations, and Company. Patricia Martin (Costume Designer) returns to T2, where she previously designed Boeing-Boeing. She is the head of the costume design and technology program at the University of Arkansas, and serves as head of design and vice chair of the Department of Drama. She has designed costumes for Arkansas Repertory Theatre, Idaho Repertory Theatre, The Southern Theatre Company, Idaho Theatre for Youth, Boar’s Head Players, the University of Idaho, and Tulsa University. She has also worked professionally in New York as a draper’s assistant on a variety of Broadway productions and as a cutter for the Colorado Shakespeare Festival and the Utah Shakespearean Festival. She is the recipient of three ACTF design awards and served as costume design and technology commissioner for USITT from 2002-2006. Genevieve Headrick (Props Designer) returns to T2, where she previously designed Next to Normal, Sons of the Prophet, Period of Adjustment, and served as run crew for ‘Twas the Night. Regionally, she served as assistant props manager for the 2010-2012 first national tour of the Broadway musical revival HAIR (Public Theater). She is Props Liaison/Head for Broadway Series and tour mounts at the Walton Arts Center, where she has also designed props for musical events. She operates in sales and technical production with Event Production Group for concerts, corporate, theatrical and social events. She holds a BFA in Painting from the University of Arkansas and an AA in Commercial Design from Seattle Central College. Melissa Haar (Assistant Stage Manager) makes her T2 debut. Previous credits include ASM for Blithe Spirit (University of Arkansas) and master electrician for Chapter 2 and 1776 (Insight Theater Company). She holds a BS in Drama from the University of Arkansas. Josh Tillotson (Technical Director) has led T2’s production team for eleven productions since fall 2010. He has worked in the New Orleans area as technical director and master carpenter and as set and lighting designer for Jefferson Performing Arts Society, St. Martin’s Episcopal School, St. Scholastica Academy, St. Tammany Arts Association, Southeastern Louisiana University, New Orleans Opera, and Shreveport Opera. He has also worked extensively in various technical positions in the Dallas metro area with Dallas Children’s Theatre, The Academy of Fine Arts, Denton Light Opera, and Six Flags over Texas. Robert Ford (Playwright / Artistic Director) is a co-founder of TheatreSquared, founder of the Arkansas Playwrights Workshop, and head of the MFA Playwriting Program at the University of Arkansas. 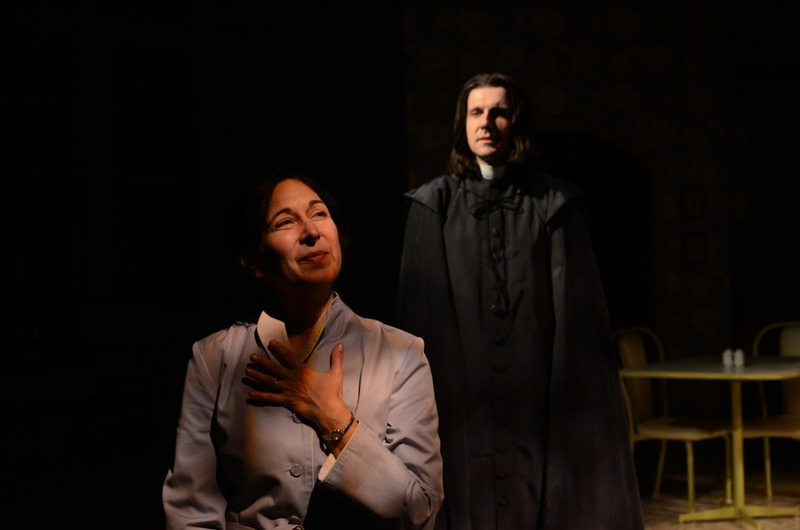 Prior to its T2 premiere, The Spiritualist was workshopped twice at the Arkansas New Play Festival, and at the Blank Theatre (LA), PlayWorks (El Paso), and most recently at the New Harmony Project, directed by Laura Kepley. Recent productions of his work include The Fall of the House (T2, Alabama Shakespeare Festival— Edgar Award nominee), Girl Band in the Men’s Room (Hollywood Fringe—Best Theatre Award), Hackensack (Syracuse University), and ‘Twas the Night (T2, published by Playscripts). His play My Father’s War (T2, 2008) has appeared on stages in England, Italy, and Germany. His novel The Student Conductor was a Barnes & Noble Discover Great New Writers pick and a “Hidden Gem” on NPR’s Morning Edition. He directed It’s a Wonderful Life and Drawer Boy for T2. He holds an M.Mus. from Yale and MFAs in Acting from Rutgers and in Playwriting/Screenwriting from UT Austin.